Day 1 Board your yacht in Juneau. Relax with hors d’oeuvres and drinks, before reviewing your itinerary with your captain. Juneau is the capital of Alaska, and while a small town of around 20,000 residents is an attractive town and home to the Alaska State Museum, which is well worth visiting for those interested. Head off to “no name” harbor at the mouth of Tracy Arm. Ice floes calving off of the nearby Twin Sawyer Glaciers pass by the harbor, flowing out of Tracy Arm Fjord. This is a great location to sea kayak, especially around the ice floes; however be careful not to approach too closely, as the ice floes can flip. Take your camera, as the colors of blue and green trapped within the ice floes are created only by the compression of glacier ice over thousands of years and are colors not to be found in any other natural phenomenon. Day 2 After breakfast cruise up Tracy Arm, a magnificent and striking fjord, while winding your way past the many ice floes floating past you downstream as you head up. The natural scenery is extraordinary with water falls tumbling over the edge of the fjord cliff sides into the fjord below with those cliff sides rambled by mountain goats, and moose, while Bald Eagles circle overhead. 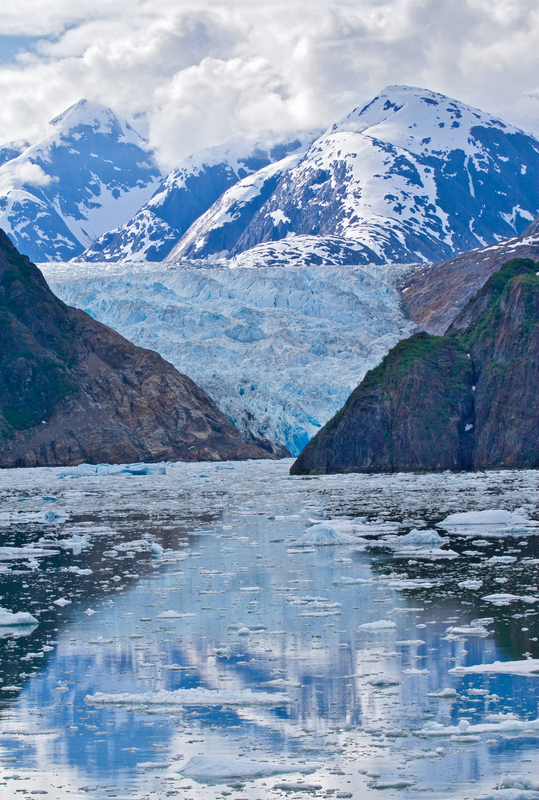 At the top of Tracy Arm are the Twin Sawyer Glaciers. Anchor nearby the face of one of the glaciers to experience the magnificence of nature, as regularly, at least once an hour, great chunks of ice calve off of the face of both glaciers with a thunderous roar while massive ice chunks drop into the sea as the glacier makes its infinitesimal creep forward. In front of the glacier facades are many ice floes on which harbor seals are sunning. There is a great scurry to action by the harbor seals each time the glacier face calves, with ice chunks dropping into the sea, along with the sunning harbor seals. Perhaps sea kayak or explore by ships tender and chip off a centuries old piece of glacier ice for evening drinks. Return back down Tracy Arm to a quiet, safe anchorage to anchor for dinner. 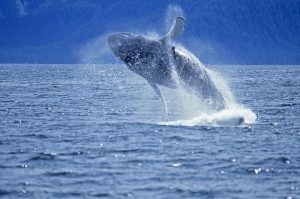 Day 3 Cruise to Stephens Passage and Frederick Sound, two of the world’s best whale-watching areas. 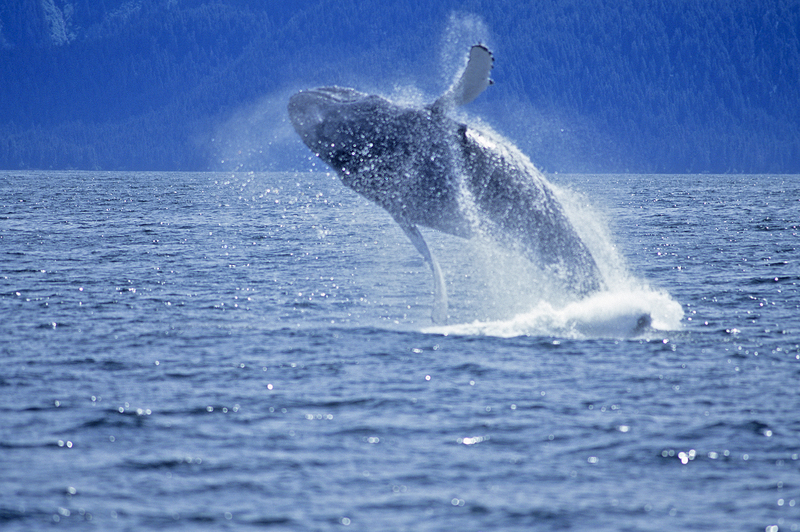 Spend the day cruising among the tiny islands viewing humpback whales, Stellar’s sea lions and Dall’s porpoises. This is the area where the whales congregate each summer after their great migration back from winter waters further south. Sit and watch, and you will most likely be treated to one of the most spectacular “dances” in nature; that of the whales bubble net feeding. A group of whales in concert will gather together to herd small fish into a central underwater area in the middle of the whale group, finishing the “dance” with all whales diving and then emerging mouth first, with mouths open wide to catch all of the trapped fish that have been pushed into the air above their open gullets. With the right on board equipment, you can also listen to the whales “sing”. In the evening, continue to Petersburg, a charming community with a Norwegian ambiance. 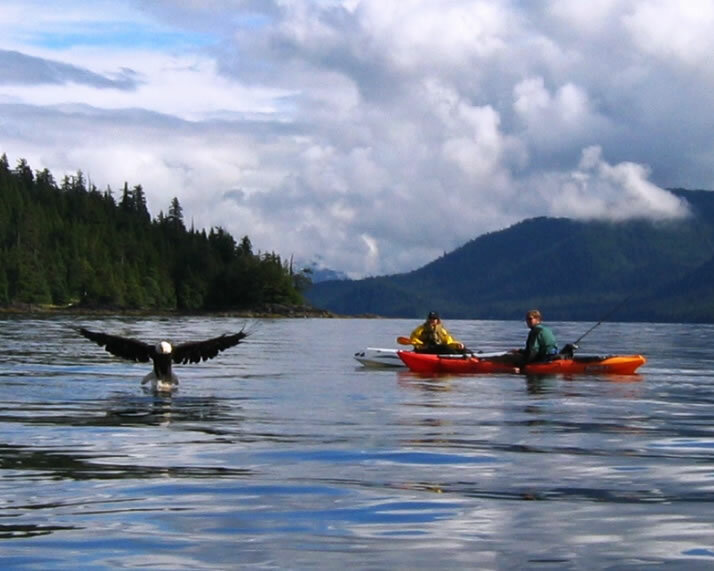 Day 4 Start the day with a nature walk through the forest filled with birds, Bald Eagles, and other flora and fauna, and return for a cruise through the intricate Wrangell Narrows, home to salmon, bald Eagles, harbor porpoise and seals, not to mention killer whales. As you cruise through this area, with quickly running waters squeezed between shorelines close by on either side, be sure to keep your eyes wide open to see wildlife in the trees and on the beaches along the shore, and marine life in the waters around. Anchor in quiet Canoe Pass and explore the surroundings by kayak or ships tender. Day 5 Cruise to the small, quaint village of Meyer’s Chuck, with a population of about 50, which includes several artists. Proceed to on to Yes Bay for an evening hike and kayaking. Set lines out to salmon fish and perhaps set crab or shrimp pots. This is an area where you may be the only yacht to be seen for miles around, completely surrounded by nature. Day 6 Enjoy a hearty breakfast before cruising to the spectacular Misty Fjords National Monument. 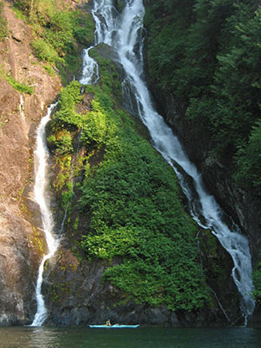 The 3,000 foot sheer granite cliffs have provided the canvas for many Tlingit pictographs and are home to Bald Eagles. If a sea plane excursion is of interest, this is the right location, and float plane tours are readily offered out of Ketchikan. Fly right up the fjords, past the granite cliffs, with glimpses of moose, mountain goats, and deer in the high mountain pastures, untouched by man. Perhaps land on an isolated lake within the Misty Fjords National Monument, and know that only a few have gone before you. Local wildlife ranges from brown and black bear to harbor seals and deer. Overnight. Day 7 Depart Misty Fjords and head to Ketchikan. This is a lovely little town, a center of the Tlingit Indian culture and home to the largest number of standing totem poles in the world; found throughout the city at Saxman Totem Park, Totem Bigh State Park, Potlatch Park and the Totem Heritage Center. 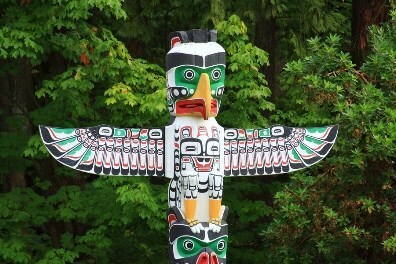 The Totem Heritage Center has the largest collection of original totem poles from the 19th century and also is a museum and center for continuing native crafts and totem pole carving. Along the few main streets are colorfully painted timber buildings, with little gift shops and several shops selling the delicious Alaskan version of cold smoked salmon and perhaps Indian smoked salmon candy, unique to Alaska, which should be tried by all. 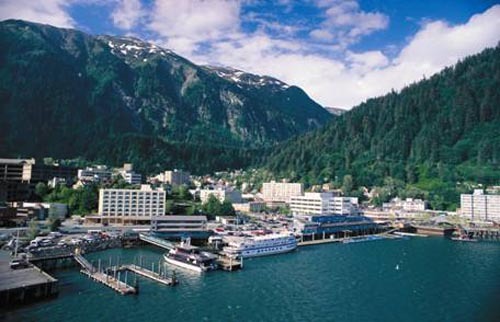 Day 8 Disembark in Ketchikan either for the return flight home or to further explore Alaska.